Agent Swete an unlikely hero comprised of organic chocolate and a member of the FBIs Food Crimes Division and his sharp-tongued partner, Anderson, investigate a series of bizarre, food-inspired crimes. Along they way they encounter a variety of characters including an extraterrestrial canine named Geoffrey, writer Ernest Hemingway, an organized crime lord intent upon finding the life-enabling eternity pasta, and an eerie, all-devouring trio known as The Metabolators. This collection includes the Xeric-grant awarded origin tale of Agent Swete, a never-before published Death By Chocolate tale, and an essay by Yurkovich on the creation of the series. 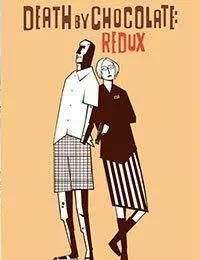 Every page has been reworked by Yurkovich, making Redux the definitive edition of these stories.